This grits recipe is easy to make, and the results are fantastic. The creaminess and smoked flavor of the Gouda cheese makes it an obvious choice to be in my top 50 side dishes. 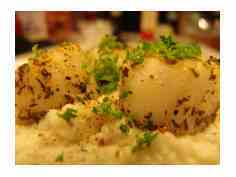 In the picture to the right, the grits are used as a bed for some grilled scallops. You should try that dish as well. But, they can stand on their own as a great side dish for any meat you choose to pair with it. Trust me, you will love this grits recipe. As I said, this dish is very easy to make, and the video below dows a great job of explaining it. 1/2 Cup of Chicken Broth: Chicken stock would also work. 1 Cup of Instant Grits: Real grits can be used as well. Follow the cooking instructions on the container. 4 to 6 ounces of Smoked Gouda Cheese: Cut it into cubes. 2 Tablespoons of Real Butter: I'm a believer in using REAL butter. As I've said, this recipe is a snap. Below are the steps. Prepare the grits with the chicken broth and the water. The chicken broth infuses the grits with great flavor. The sum of the water and the chicken broth should equal the amount of water called for on the container to prepare the grits. Once the grits are done, add in the cubes of Gouda cheese. Mix until all the cheese is melted. Add in the garlic powder, Fuzzy's Kicker, pepper, milk and butter. Stir until well mixed and creamy. Leave Grits Recipe and Return to BBQMyWay Homepage.